College life is exciting — but it can also be frenetic and demanding. To succeed in college, every student needs a good planner. 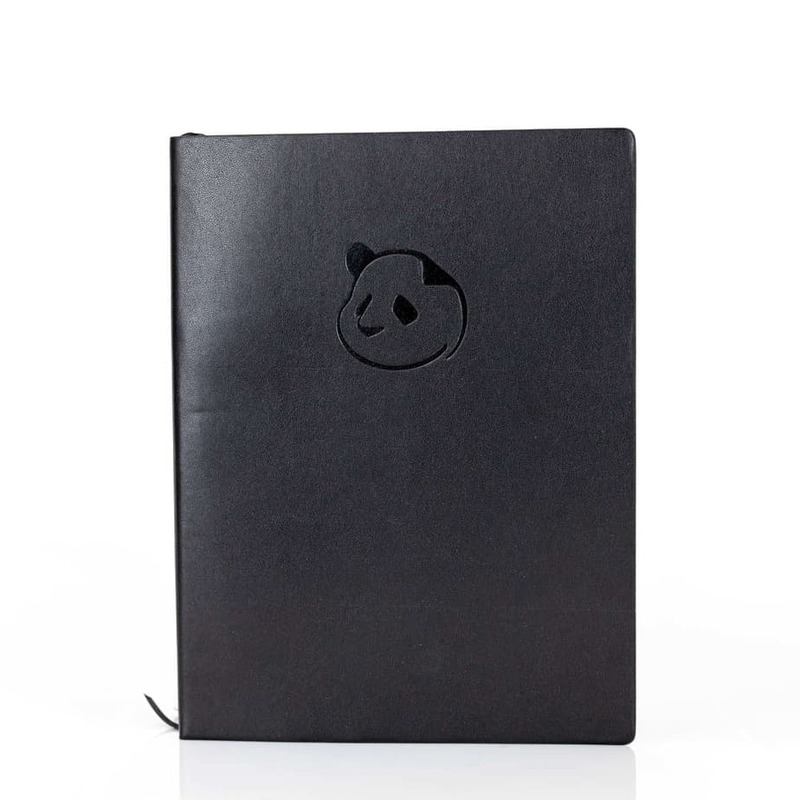 Our choice for the best planner for college is the Panda Planner. Scientifically designed to make you more productive and happier, the Panda Planner will help you strike the right balance between school and life. When is that big project coming due? What time is my lab science meeting? When are final exams scheduled (because I am SO ready to go home!)? What about that big party Saturday? Success in school, whether academic or personal, depends a great deal on staying organized. Luckily there are several great planners designed to help you navigate the pressures and stresses of life in the modern university. The daily planner that we know and love today is the distant cousin of the almanac and the diary. Almanacs provided the date structure, while the diary component was often inserted via loose-leaf paper. In fact, George Washington had such a planner — and thank goodness he did, or he might have missed the battle at Yorktown! This eventually evolved into the daily diary, which became wildly popular in the 19th century, and were even carried by soldiers during the Civil War. In the past, most planners consisted of a simple pocket calendar with space to record the day’s events. Today’s planners are far more sophisticated, specialized, and forward looking, with an array of designs and approaches to choose from. In order to find the very best college planners we conducted hours of online research, consulted with industry experts, and even secured appointments with some very busy college students! We put pen to paper (to see if the paper would bleed), did our mindfulness exercises, made our gratitude lists, and checked the weight of these planners, all so you wouldn’t have too. Then we compiled a list of the 10 best college planners just for you. Science, history, business — whatever your area of study, get organized with our top picks! Our overall highest rated college planner is the Panda Planner. With a sleek and stylish design, the 90 day Panda Planner draws on insights from cutting-edge research in positive psychology and neuroscience to help you reach your potential and achieve your goals each and every day. If you need a planner that won’t bust your budget, then we recommend the Essential Academic Minimalist Planner. With variable design layouts, offering plenty of space to write on good quality paper, this no-frills annual planner has been a staple for teachers and students for over 50 years. Boasting a faux-leather soft cover, the Academic Planner by Lemome exudes style and competence — 2 traits every college student wants. This annual planner comes with a mind map to help you focus on your larger goals and vision, while also providing great features for keeping track of your everyday appointments. It’s no secret that a college degree can open doors to higher earning potential, but it can be really expensive. In order for most students to make it through, putting in hours working to supplement income has become a necessity. Students must now find a way to balance their relationships and social life with the heavy demands of college level courses, and increasingly the 2 or sometimes 3 jobs needed to pay for their education. It’s a lot to take on. These increasing demands have contributed to an increase in levels of anxiety and depression. In fact, according to one recent study, 1 in 5 college students struggles with either anxiety, depression, or an attention disorder. Experts in mental health have some suggestions that could help lower that stress and help with organization, making for a happier, healthier you. One of their top strategies is to use an organizer or planner. It’s a pretty simple tool that can make a BIG difference. The planner or organizer embodies a philosophy or way of seeing the world, where the user is encouraged and empowered to arrange their daily, weekly, monthly, and yearly tasks and to prioritize their goals. Of course, today’s organizers are more refined and focused than earlier versions, but the idea is still the same: tame the chaos of everyday life by bringing order to it. This philosophy has proven to be effective and popular — so much so, that business empires have been built on the publication of organizers and planners. The recent surge in digital planners, however, almost made the paper planner obsolete. That is, until recent neuroscientific studies showed that handwriting had major benefits for brain development, deeper learning, memory and retention, and brain elasticity. Neuroscience has shown that the brain is divided into different regions each of which process different types of information. Visual information, auditory information, verbal communication, emotions, etc. are all processed in different parts of the brain. A key component for brain development, memory, and deep learning is to connect these different regions with one another. For instance, when you are in class listening to a lecture, the auditory region of your brain is processing and sending some information to you memory, though in a somewhat indiscriminate way. However, if you are taking handwritten notes while listening to the lecture, the physical act of writing plays a significant part in helping to organize the information in your memory because it engages a different region of the brain. When you link up the verbal processing part of the brain with the spatial, it not only organizes and orders the information, it also imprints it in a more secure fashion in your memory –meaning you retain more information. The human mind is so cool! So chances are much better that if you write down your appointments, contacts, goals, or to-do lists, you will actually remember them at a much higher rate. Goal setting planners usually offer spaces for reflection and represent a more up-to-date version of the calendar and journal combination. These planners often have spaces for gratitude lists, affirmations or expectations, as well as visioning sections. They can also come with instructions for how to break down a specific goal or task into increments (usually of about 25 mins), so that you can plan out how you will accomplish your goals or realize your vision! Retro planners are based on designs dating back to the 19th century and appeal to those who want that “old school” style! These are often designed to look like old books, with rough-cut pages and are paired well with fountain pens. Some planners offer the ability to customize the layout and features of your planner to meet your daily, weekly, monthly, or yearly needs. There are also numerous specialized planners that are designed to meet the specific needs of entrepreneurs, working mothers, parents who have children with autism, or dozens of other specialized categories. Our ranking is based on metadata analysis of trusted review sites, hours of online research, reading and watching innumerable reviews by customers who bought and used these products, and inspecting the merchandise for ourselves! Price: All of our planners are under $35, but some were more expensive than others. Features and Layout: Whether you’re a goal-setter, visionary, or just want to keep track of your appointments, there are many layouts and features to choose from. Paper Quality: Good quality paper is a must; nobody wants their ink to run. Style: Planners don’t have to be dull looking. Durability: Most planners are meant to last a year, so no one wants theirs to fall apart in less than a month. Underlying Philosophy: Productivity, goal-setting, or well-being: every planner is based on a philosophy meant to help you organize your day and your life. Whether keeping track of due dates, practices, work scheduling, or the big party this weekend, our rankings will help you make the right choice to kickstart your organizational habit. You’ll be calmer, happier, and more able to live your best life. 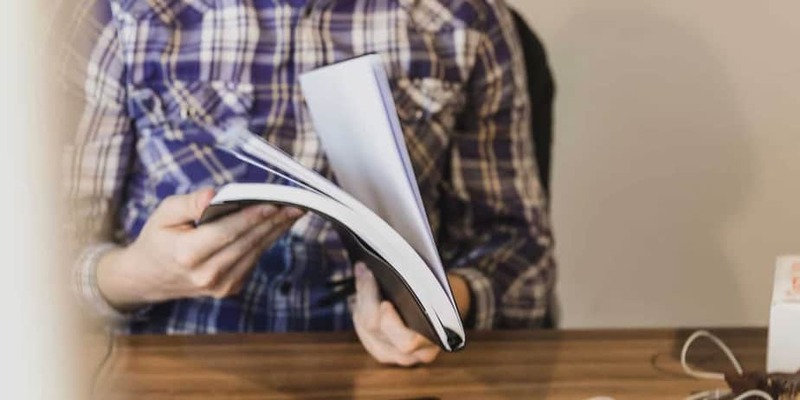 A compelling story from the founder of Panda Planner, Michael Leip, brings into focus what makes these planners special. Over a period of 5 years, he struggled with Lyme Disease, traumatic brain injury, and more recently, cancer. Each of these unleashed depression, anxiety, and an inability to focus. As an entrepreneur he needed to find a way to organize his life, so after significant research in psychology and neuroscience, he developed a method to help organize and himself. This eventually evolved into the Panda Planner. The Panda Planner offers a unique combination of goal-setting and positive psychology, delivering a tool to help you focus, set your goals, craft your vision, and achieve your ideals. The 90 day planner offers a monthly, weekly, and daily view. The monthly helps you set your goals, the weekly helps you process the preceding week and look forward to the week ahead; while the daily section includes sections for laying out your mini-routines for happiness and prioritizing your goals. This annual planner features 12 months of monthly and weekly pages and comes in a beautiful Faux Leather cover that is environmentally friendly. Each month offers an overview with a section for notes, while the weekly pages have ample space for writing out your daily schedule to keep track of your assignments and appointments! A unique feature is the mind map, where you are encouraged to develop and prioritize your life goals and vision, and to break them down into manageable tasks so that you can realize your dreams. With spaces to keep track of what you are grateful for, in addition to more standard features, this Academic Planner is aimed not only at helping you to be productive, but to become the best you, that you can possibly be! The name says it all! If you are looking for a planner that will help you beat procrastination, take advantage of your time, stay on top of your assignments, and meet every deadline, then the Productivity Planner by Intelligent Change is for you! 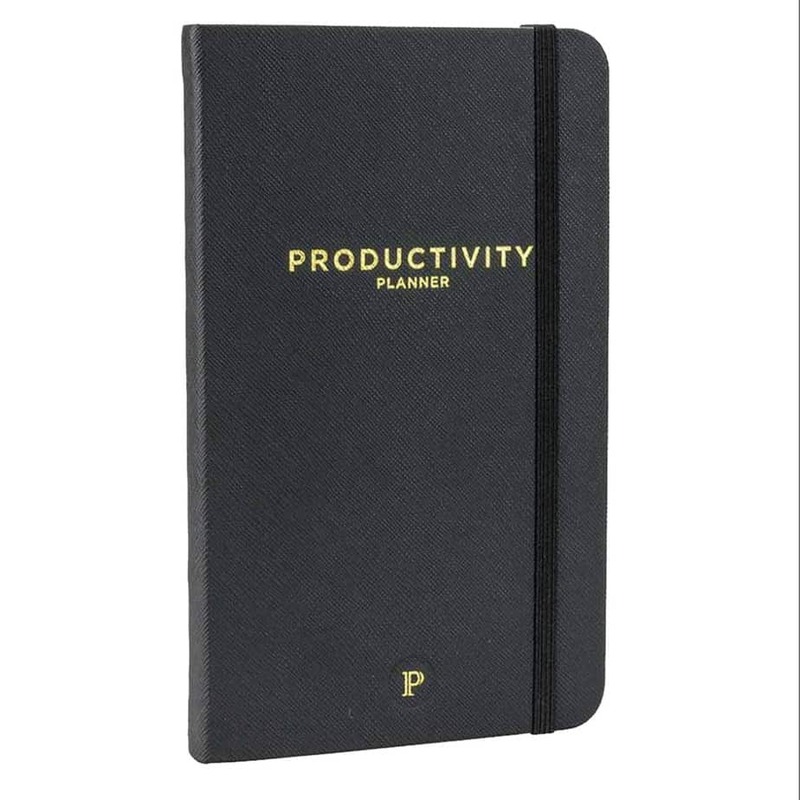 Based on time tested productivity principles, this planner will help you be effective and successful in your college career. This 6-month planner comes with weekly and daily views. Each day comes with an motivating quote to give you focus and inspiration. At the front, the planner describes the philosophy of the “one thing” on which it is based. The basic idea is that to be productive, prioritizing and choosing one major goal will lead to the most efficient and effective use of your time. There is space to break down your goal or task into 25 minute increments, so that you make the most of your day. There is also space for secondary and additional tasks, for those days when you really knock it out of the park! Are you hampered by procrastination? Do you feel controlled by an inability to focus? Well the Freedom Planner Pro is designed to set you free and unleash your productive potential so that you can live the fullest life! Like some of the other planners on our list, the Freedom Planner aims to be more than just an organizer — it is meant to be a tool for self-improvement. This undated annual planner offers a weekly and daily layout that incorporates an hourly design to help you maximize your time management skills so that you can get and stay organized. With space for casting a vision and prioritizing goals before each month, and assessing your accomplishments at the end of each month, the Freedom Planner gives you the space needed to process where you are in realizing your dreams. 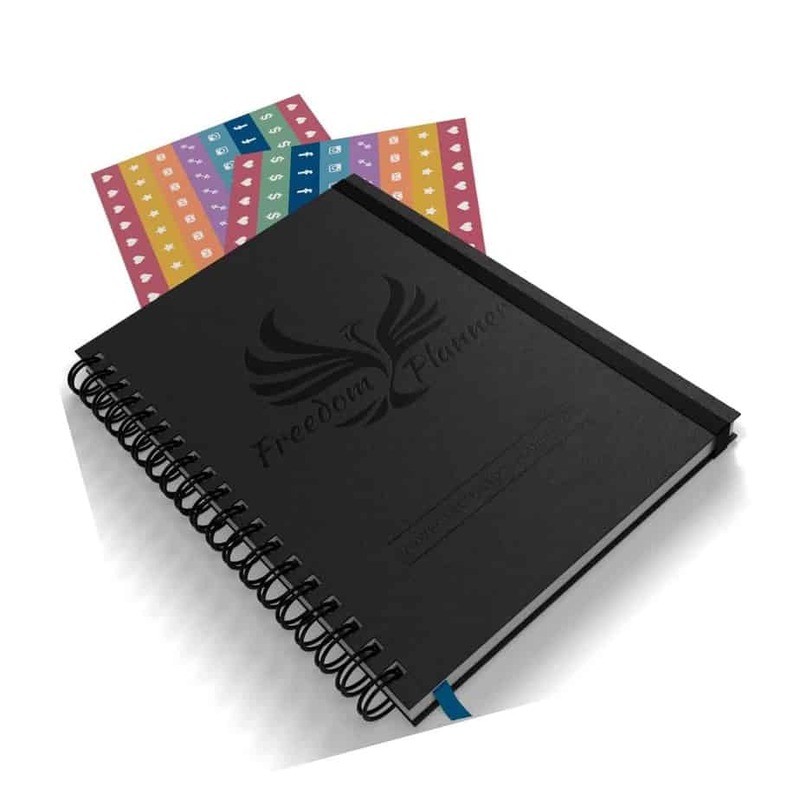 The Freedom Planner is also an eco-friendly option, using only 100% post-consumer recycled paper. What’s in a name? In the case of the Essential Academic Minimalist Planner, everything! This no-frills classic provides exactly what is advertised — the essentials. This annual planner comes with a monthly and weekly layouts, in the standard column design, with each day offering hourly scheduling slots from 7 am to 8:30 pm. The Essential Academic Minimalist Planner is large with lots of room for writing in your appointments, practices, doctor appointments, or projects, and comes with a vinyl protective front and back cover. 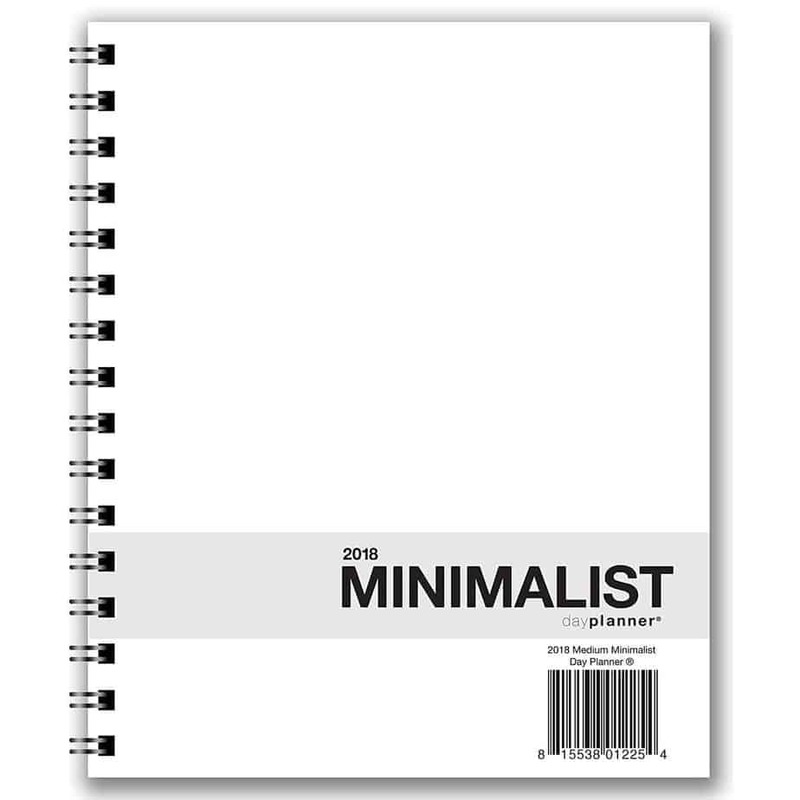 A highly functional, but basic planner, the Essential Academic Minimalist Planner is also an excellent price. Global Products, which has been in business since 1965, offers excellent customer service should you need to return or customize your planner! Much like the Panda Planner, the Passion Planner was born out of necessity. Angelia Trinidad found herself somewhat aimless after she completed college in 2012, and wound up designing the Passion Planner to help her organize and simplify her life so that she could focus on what really mattered. With 10 color and design options, the Passion Planner includes sections for deadlines and appointments, as well as to-do lists for personal and work life. There are also spaces for gratitude lists, doodling, notes, and monthly check-ins for reflection. The unique Passion RoadMap is tool for helping you to think through and prioritize your monthly, annual, and even 3-year goals so that you can pursue the things that really matter to you! The innovative Get One, Give One program highlights the socially conscious nature of the company, as customers are able to support causes like breast cancer research, veteran support, animal shelters and more. An excellent plus for anyone who wants their purchase to make a difference not only in their life, but in the lives of others! Although this planner is about as straightforward as it gets, it does offer some features for college students, including a number of handy reference pages with job interview techniques, time management tips, and suggestions for effective studying. 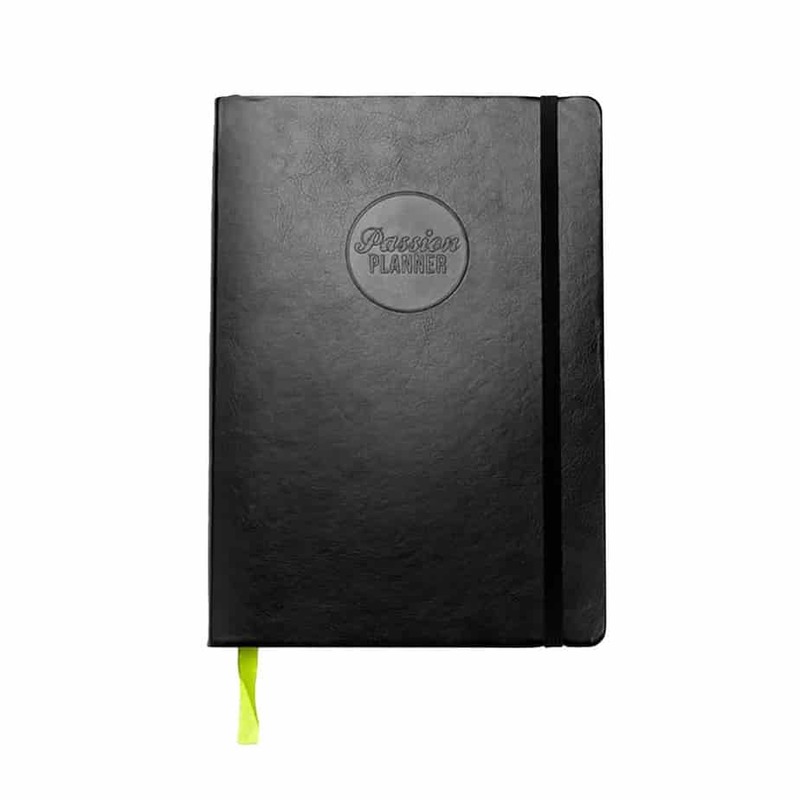 The planner’s simple black cover gives it a polished, professional appearance. And for those looking to keep their environmental impact small, the paper includes a minimum of 30% post-consumer waste recycled material. Another planner that aims to boost productivity and happiness, the stylish Clever Fox Planner comes in a re-usable keepsake box, using 100% recycled paper. It also includes 3 pages of icon stickers all in primary colors with images for dinner, travel, gifts, family, money, exercise, etc. There are sections for gratitude lists, habits/rituals, and affirmations, as well as a section for vision-goals for the year. Unique to this planner is that the goals section is broken into several categories, including spiritual, finance, personal development, business/career, family, health, and relationships. There is also a section for prioritizing your goals and a mind map with instructions for how to break down your larger goals into achievable and manageable steps. This annual planner is also undated, allowing you to begin organizing your life today. 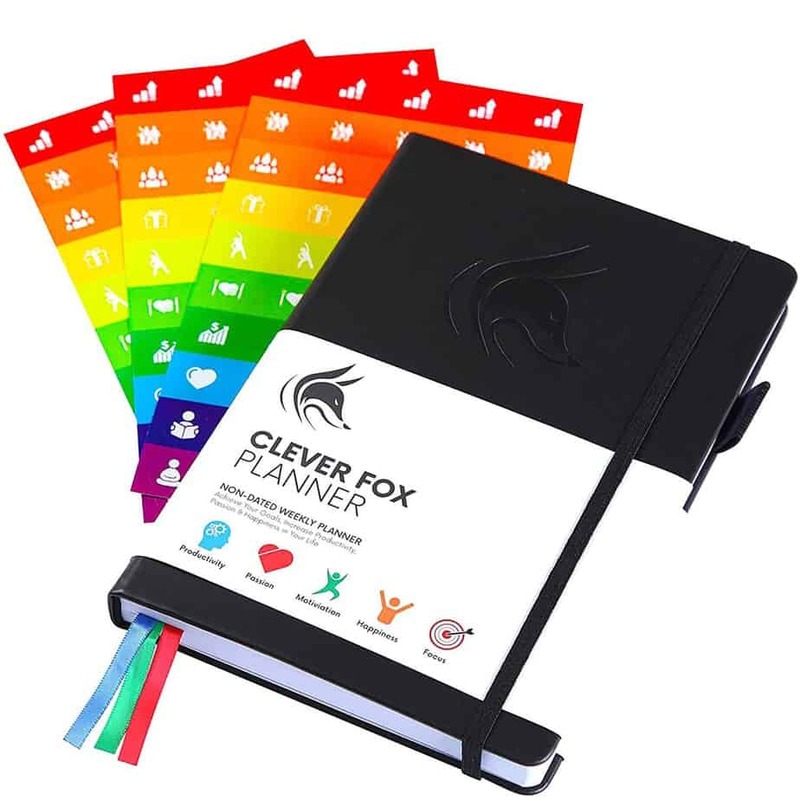 The Clever Fox Planner is lightweight and stylish, great for students or professionals on the go! 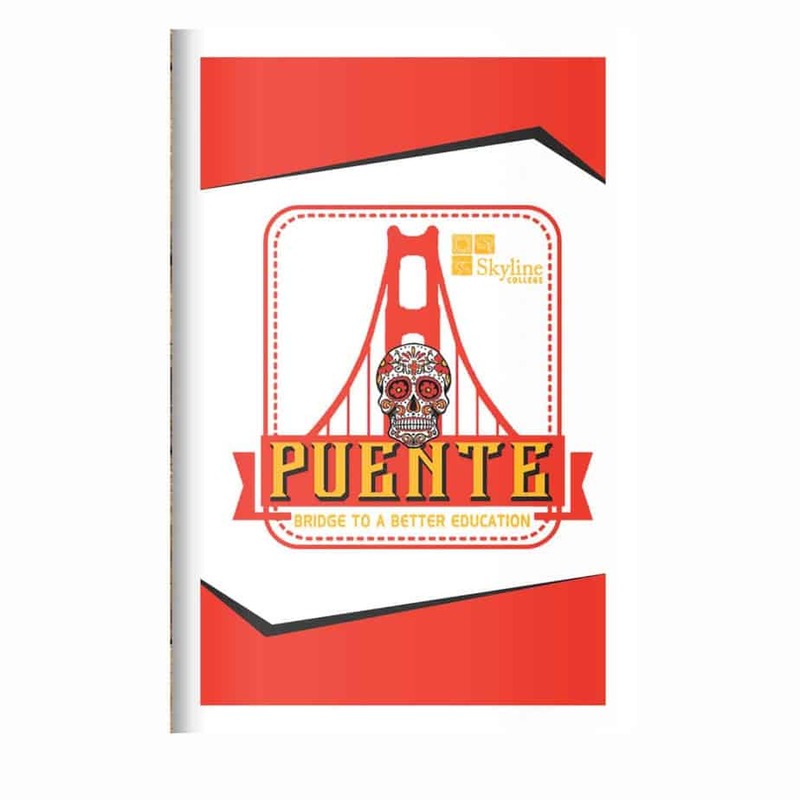 The Student Planner is another no-frills planner specifically aimed at students — go figure! The aim of this planner is to help keep you organized during the school year. To that end the planner features a page for filling in your academic schedule for the week, as well as an attendance sheet so that you can keep track of how many times you have skipped class. There is also a page specifically designed for keeping track of your exam schedule throughout the year. Though not boasting the same kind of philosophical sophistication as other goal-oriented planners, nevertheless, there are pages for writing out your goals with space for breaking down the goals into manageable steps and places to check off your achievements. 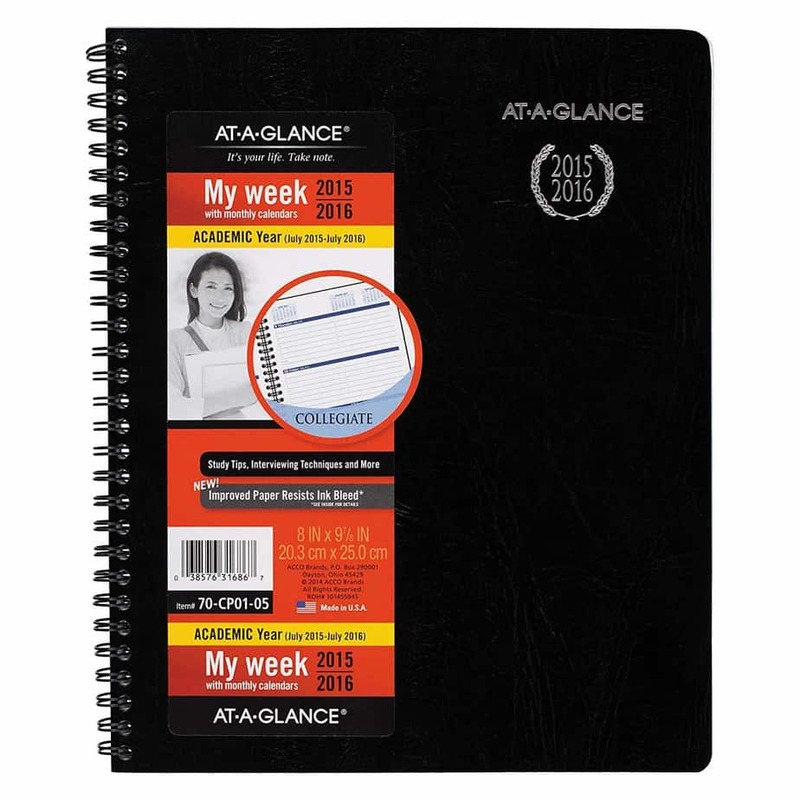 The monthly and weekly planning pages provide ample space for keeping track of your assignments, and there is space for keeping track of future or upcoming events or assignments. And the price of this planner is hard to beat! 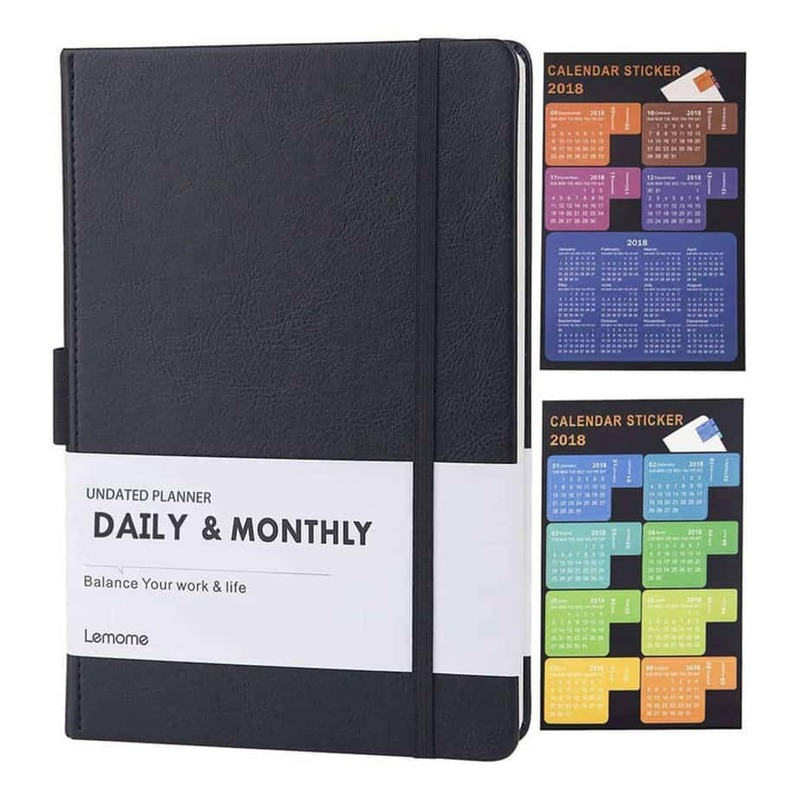 If you are looking for a no-nonsense planner, this may be the one for you! 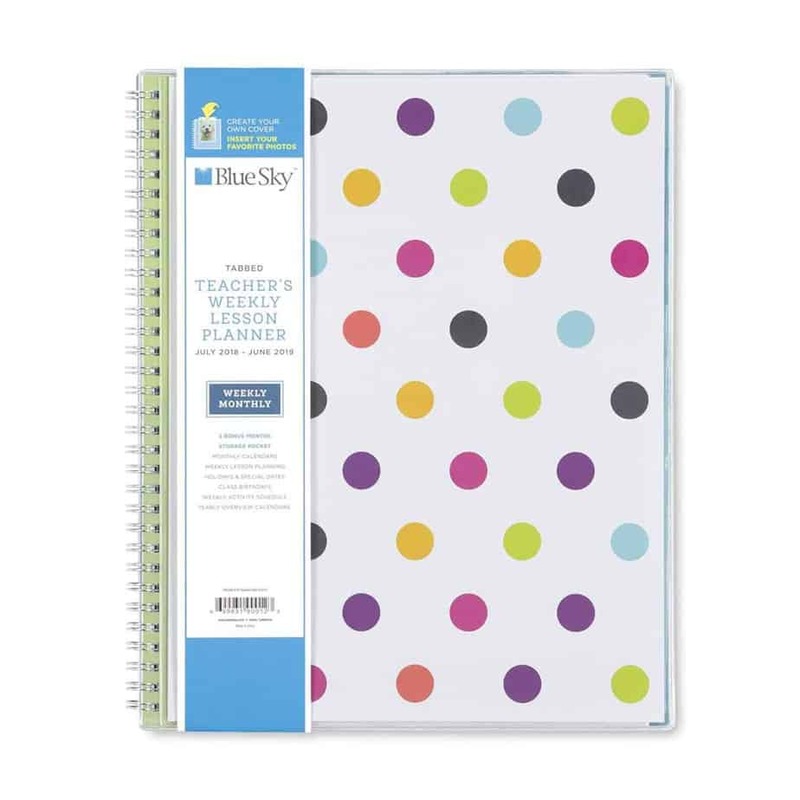 Rounding out our list is the Blue Sky Academic Year Planner. This annual planner features 12 months of weekly and monthly pages, going from July to June. The monthly and weekly views are laid out over 2 pages to give an overview of your time. There is ample space for your daily schedule, to-do lists and other notes. This planner comes in 2 different sizes: 5 x 8 inches or 8.5 x 11 inches, with numerous designs and colors to choose from that can fit any style. This is also an environmentally friendly planner, using 50% post-consumer waste recycled paper. With some features like monthly coated tabs, twin-wire binding, previous and next month reference calendars, monthly notes, and a to-do column, the Blue Sky Academic Calendar offers a no-frills planner at a relatively affordable price. Why do I need a planner for college? Great question! 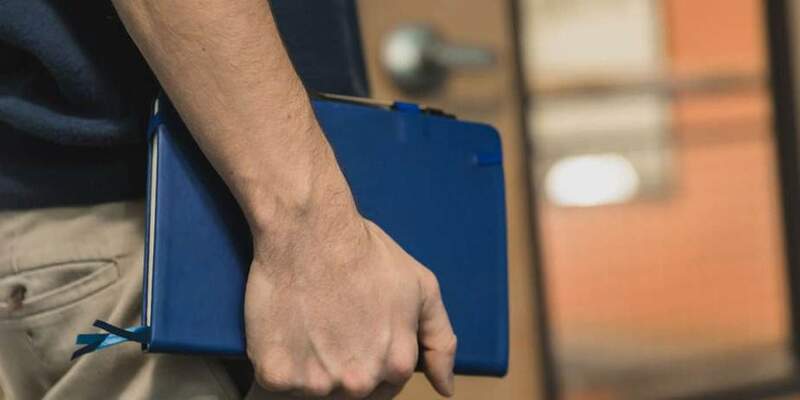 There are a number of reasons that you should consider using a planner in college. First is the fact that using a planner will help you develop your time management skills. Adult life can be hectic, and college is a great place to not only learn about the subjects you will study, but to develop good habits that you can carry into your career and life beyond college. 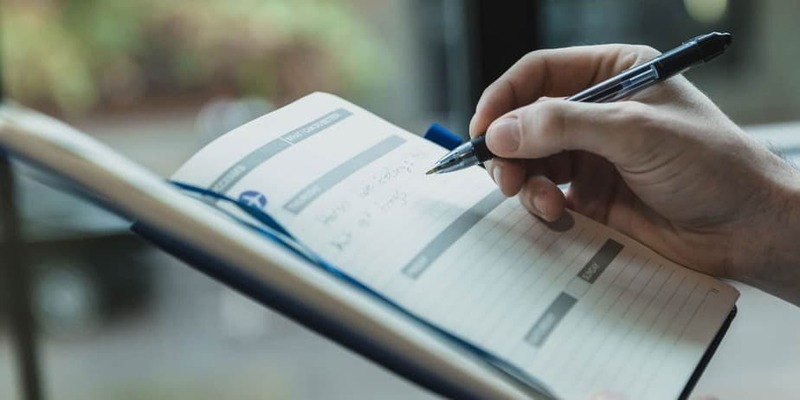 Of course, the immediate benefit is that using a planner will enable you to keep track of the myriad assignments, projects, dates, and other events that will fill up your social and academic calendar. Writing down your assignments and dates gives you some control over the many demands that life will throw at you, and as you accomplish your tasks, checking off your list of to do’s can be really empowering! Third, using a planner can help you get focus on the “big picture.” What are your goals, both short-term and long? Contemporary organizers and planners can offer you a way to conceptualize not only what your week looks like, but where you see yourself going. Finally, many planners today also offer journaling features which gives you the chance to record and reflect on significant events, so that later you can look back on the important things that have happened in your life and see the ways in which you have grown and developed as a person! What’s the best way to use my planner for college (and work, and practice, and…)? Record permanent events: If you know of a birthday, or a holiday, or when finals week is scheduled, you should write it in. These kinds of permanent dates can give a useful structure to your weeks, months, and years. Record permanent due dates: After you receive your syllabus during the first week of class, write in any key due dates for major papers, exams, or projects. This will give you peace of mind and you can revisit your calendar as you begin to plan out how to complete your project or paper, or to study for the big exam. Write down homework assignments: During the course of the semester, it is a good idea to write down your homework assignments. These not only gives you a way of keeping track of your work, but can also play a role in making sure you remember to do your homework! Weekly goals: Record your weekly goals. Take time to look through your calendar to see if you have any major assignments coming up. If so, list them in your weekly goals. Break down the day: It is a good idea to break down the day into chunks of time, so that you can see how you are spending your time, and so that you can allocate the appropriate amount to any given project or task. Breaking down your time into 3 hour increments is a good rule of thumb, though as you become more proficient you may decide to break down your time further. What are the best planners for college? Finding the right college planner can be challenging. There are so many designs, layouts, features, and philosophies on the market. We have taken some of the guesswork out of choosing a good planner through our extensive research to help you make an informed decision! What types of ink can the paper handle? What is the size and weight of the planner? Is it portable? What kind of design or aesthetic does the planner employ? Is the planner annual, 6 months, or 3? Does the planner include daily, weekly, or yearly layouts? Does the planner include a journal element, such as a place to make gratitude or affirmation lists, goal lists, or other processing or visioning? What is the cost of the planner? 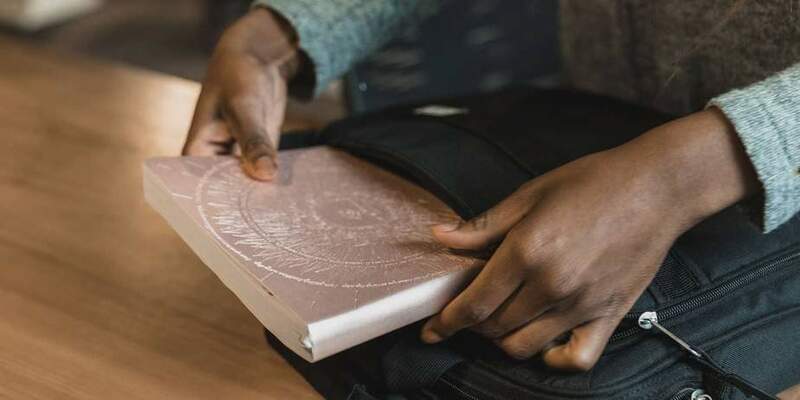 Taking these questions into account, we have zeroed on some of the key qualities that most people look for in a good college planner. 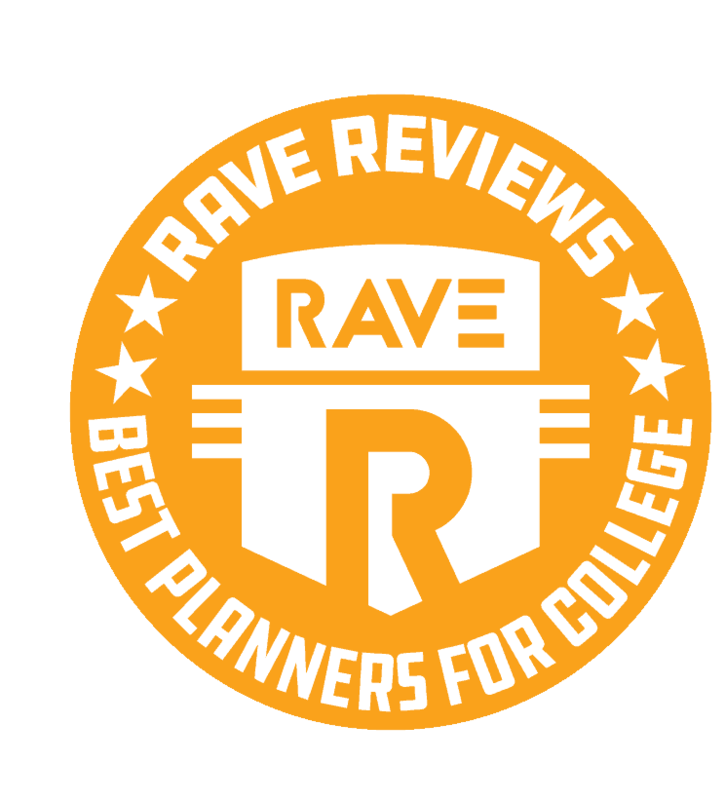 Our research led us to the Panda Planner as the best overall planner for college. Before you head off to college, take a look at our list as you decide which planner will help you organize your education and your life! Swissgear 1900 Scansmart TSA Laptop Backpack: Top of the line backpack for carrying all your school supplies. AmazonBasics Mesh Desk Organizer: Keep you desk organized with this handy (and affordable) organizer. Boao 1000 Pieces Sticky Notes, Calendar Planner Stickers, and Index Tabs: For those who just can’t get enough planner accessories — this one’s for you. Dryden Luxury Fountain Pen: If you’re going to be writing in your planner all the time, you may as well get a really beautiful pen to do it.